LONDON, Sporting Alert — Arsenal have left some big names out of the starting lineup for today’s Premier League clash at Chelsea. Manager Arsene Wenger, who was heavily criticized for picking players not wanting to be at the club in the 4-0 drubbing by Liverpool, has decided to leave Alexis Sanchez on the bench today, while Mesut Ozil is out of the squad altogether. 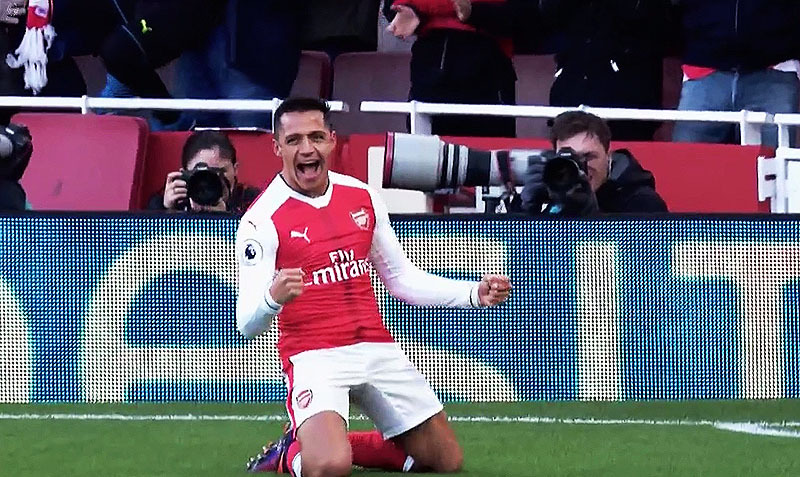 Sanchez impressed for the Gunners in the Europa League in midweek, but Wenger has decided to leave the Chile forward on the bench to start this game, with Alex Iwobi coming into the team. The change is the only adjustment to the starting lineup featured in the win over Bournemouth last weekend. There is no place, however, for Ozil, but club record signing Alesandre Lacazette gets his start in a big game and will also have Danny Welbeck in support. Sead Kolasinac was impressive off the bench against Cologne in the Europa League in midweek and he starts. Meanwhile, manager Antonio Conte has made two modifications to the side that beat Leicester City last weekend, as captain and leading center-back Gary Cahill returns from suspension and is slotted straight back into the starting XI. Also coming in is winger Willian to add more pace to the side. Eden Hazard is among the substitutes today, along with Antonio Rudiger and Tiemoue Bakayoko. Despite a very effective goalscoring performance in the Champions League in midweek, summer signing Davide Zappacosta is only on the bench as Victor Moses starts at right-back. Team to play Chelsea: Cech, Koscielny, Ramsey, Lacazette, Iwobi, Monreal, Mustafi, Welbeck, Bellerin, Xhaka, Kolasinac. Subs: Ospina, Mertesacker, Sanchez, Giroud, Walcott, Maitland-Niles, Elneny. Team to play Arsenal: Courtois, Alonso, Fabregas, Kante, Morata, Pedro, Moses, Willian, Cahill, Azpilicueta, Luiz. Subs: Caballero, Rudiger, Hazard, Bakayoko, Zappacosta, Batshuayi, Christensen.